Kelly green is my favorite color. It's probably pretty obvious from the design of my blog and the fact that last week I wore a bright green coat. I'm just obsessed. There aren't too many things that I am "known for" (besides strange things like wearing two different shoes to class in middle school and that one time I stole an old lady's grocery cart), but people know me as a green-lover. They'll bring me little green things they saw with a "I saw this and thought of you." I can't say that I mind... I love it actually. Bring on the green! And now, for some boring clothing commentary: I am obsessed with these booties. I found them at TJ Maxx last month and I have been wearing them non-stop. I usually have pretty awesome luck there when it comes to shoes, but not so much with their clothes. I don't know if they just mark down their shoes more often or something, but whatever it is, I'm not complaining. What about you? Are you as obsessed with your favorite color as I am? Do you have any luck at TJ Maxx? This is one of my favourite outfits, Ashley! Such a fresh combo of green, white, blue and brown! And the icing on the cake is the statement necklace! Lovely! I'm wearing the same cardigan right now! haha I really love this outfit! The green is such a fun color :) I don't own a lot of pieces in this color, but people think of me with purple. Maybe because it was my wedding color! Then my hubby always thinks of me when he sees clothes in mustard yellow. I think I have a different color for each person! Hah, what are the chances, I am white and emerald today as well..heh..Love the collar necklace a lot..Very pretty! Stopping by from Pleated Poppy link up. Great booties! I actually don't have a TJMaxx nearby so I'm usually looking more at Marshall's or Ross. Your necklace looks great with you green top too! First of all, kelly green looks gorgeous on you! And I love that necklace!! I NEVER have luck at TJMaxx or Marshalls or places like that. I don't have the patience to dig, plus I don't think our stores get very good things. At first I thought the necklace was the collar on the shirt, hehe. Great outfit, love the cuffed pants and the booties! this green is probably my favorite color, too. Back in high school, it was impossible to find anything in green. Everything was dark forest green and I was determined to find the perfect grass-green colored top. I finally found one at Casual Corner (which I don't think exists anymore), but the neckline was covered in sequins. I bought, and removed the sequins and was so happy! And now it's pretty easy to find green things. I just bought a pair of green jeans a couple weeks ago! I'm pretty excited to wear them once I'm done with the 30X30! Who wouldn't be in love with a color that looks great on them! :-) I love your booties! I'm not so lucky at TJ Maxx being that I wear a size 11.
this color looks fantastic on you! I haven't had luck at TJMaxx since moving-- it must get scrounged over by all the townies first. But yay for having something you love to wear! I LOVE that necklace!! 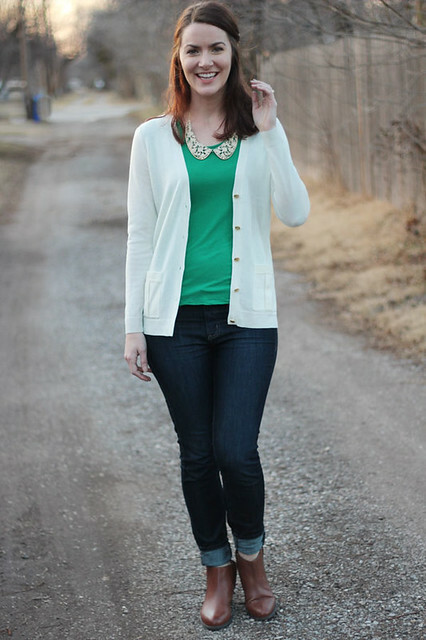 Totally takes a simple outfit and makes it pop :) I did three outfits with navy and green last week. I am having a love affair with green as well! You look great in green! I am loving your necklace, too! How cute are you?! Love the green. Love the little collar so cute. I'm in a green sweater now - it's also my favorite color! 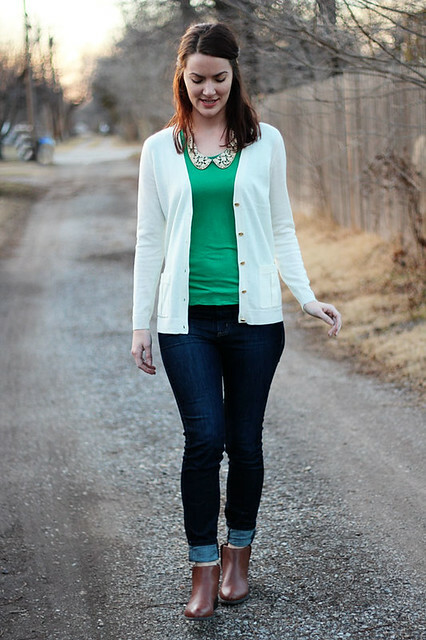 This outfit is the definition of comfy and put together! So cute! I love the boots with the jeggings - and what a great sweater on top! Green is my favorite color too, but I hardly ever buy items in green to wear! My kitchen is painted green, but I rarely wear it. 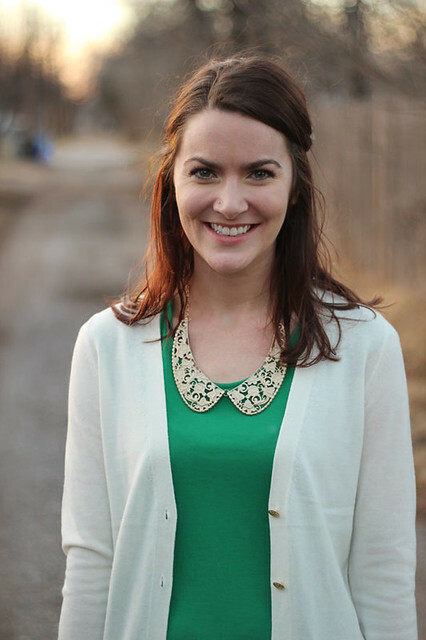 This top, though, is such a perfect shade of green, and I love how you paired it with the gold collar!! Well you look awesome in Kelly green! And that necklace is perfect with it! And those booties look ridiculously versatile! I have to mentally prepare to dig at TJ Maxx! But when I have the patience, it's an awesome feeling to score a huddle jewel like those booties! i love the color combination and beautiful necklace! This is a great outfit! Kelly green is such a pretty color on you. And I love the name of your blog! Well, that is a good color on you. I can see why it's your favorite. That necklace is so cute too. I have a love/hate with TJ. It totally depends on the store. When I go back to visit my family in Michigan, I always find the best things at their TJ but not so much in South Florida. I don't know why. I know you well now since have been following for over a year now and I know Kelly Green is your color. It is in my top 5 as well. Red is my Most Favorite Color and I own a ton of it. Looking forward to Valentine's Month just for that alone. I, too love your Booties and that adorable Peter Pan Necklace. I find TJ Maxx & Marshalls a headache when it comes to shopping for clothes. I am not one to dig there really, unless it is at the small front aisles. But I do agree, I find shoes much easier there and some of my favorite shoes and designer brands nevertheless are from there. Stop by Elegance and Mommyhood when you can. Thank you for wishing Vivian a Happy 1st Birthday also. I have the best luck at TJ Maxx! It is my go-to! I just love that place. And I think I need more kelly green in my wardrobe...since I have none, but I do love that color! You've inspired me! Those boots are pretty dang cute on you! I'm definitely a green person as well. I love this color. And it looks AMAZING on you!! I agree...it's so fun when people say "i thought of you when i saw this." I'm pinning this outfit right. now. TJ Maxx is one of those American stores that I've heard so much about with great deals -- I'm looking forward to trying it out this summer! It sounds similar to Marshalls or Winners, am I right? Like you, I enjoy going there to check out their shoes but I don't always have the patience to rifle through the racks. Sometimes it's frustrating to deal with the lack of customer service and just easier to pay a few dollars more at a regular retail store, know what I mean? Depends on my mood I suppose, if I'm in a browsing "thrill of the hunt" kind of mindset! you found those booties at tj maxx?! excuse me while i go run there. and i love kelly green too- it's *such* a beautiful shade. i have a knit skirt in that color and it makes my blouses look amazing, it's so eye popping! I love this green and white combination. You look so beautiful! Green has never really been my color (I can count on one hand the number of green things I own) but it looks gorgeous on you. I hope to be able to add more kelly green (my favorite shade) and olive green (my safe pick) into my closet this year! I have a colour business. Its so good to see a beautiful everyday outfit that's not black. this is definitely the type of outfit I'd wear. You have a lovely figure. I got your details from Fashion and Faith. I will follow on bloglovin and twitter. If you would like some facebook love let me know, I could do with some myself! I love all your green pieces. Green looks good on you! I'm loving the collar necklace with this outfit. Great styling! 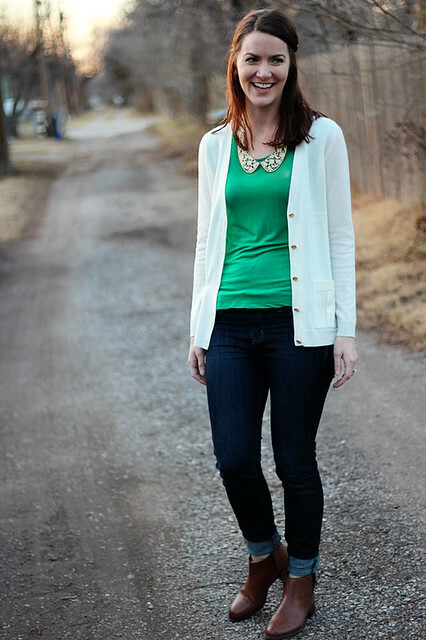 Love your green top, it's such a great punch of color on an otherwise grey winter day! And that necklace is such a cute addition! Ps. Loved your post on celebrating 5 years of marriage. Thanks for sharing such wonderful travel tips!